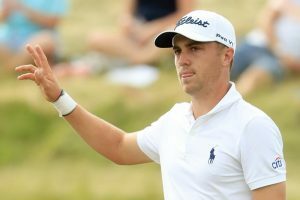 Justin Thomas landed a 3-wood on the 18th green where some players couldn’t land a wedge, leaving him an 8-foot eagle putt that he calmly made for a 9-under 63 that matched one U.S. Open record and broke another. It also put him squarely in the mix to capture his first major. On an Erin Hills course that again lacked enough wind to be the stern test that the U.S. Open wants, Brian Harman weaved his way through traffic at the top of the leaderboard Saturday for a 5-under 67 and a one-shot lead over Thomas, Brooks Koepka and Tommy Fleetwood. 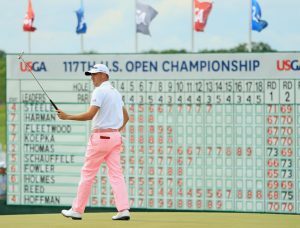 Thomas became the fifth player to shoot 63 in a U.S. Open and the first player at 9 under. And if his hot pink pants were not enough, he did it in style. He had 310 yards to the hole when he hit 3-wood that could have led to big trouble if he went too far long or left. “Oh gosh, Jimmy, be good,” he said to caddie Jimmy Johnson when the ball was in the air, and it was close to perfect. The ball landed on the front of the green just soft enough that it rolled out 8 feet by the hole. Thomas poured that in to become the 29th player with a 63 in a major championship. “The finish was awesome. I’d love to have another one of those,” said Thomas, who posted at 11-under 205. The way this U.S. Open is going at Erin Hills, he might need it. Only six players had ever reached 10-under par or lower in the previous 116 U.S. Opens. There are five players in double digits at Erin Hills. Harman was at 12-under 204. Koepka also reached the green in two on the 667-yard closing hole for a two-putt birdie and a 68. Fleetwood was poised to take the lead until his pitch to the 18th wasn’t strong enough and his next shot went beyond the flag and down the slope some 70 feet away. He got that up-and-down for a bogey and a 68. Rickie Fowler, sharing a house with Thomas this week, was being left behind until he ran off three straight birdies and shot 68. He was 10 under. Not to be overlooked was Si Woo Kim, who captured The Players Championship last month. He shot 68 and was only three back. Even with the course drying out, there simply was not enough wind to frighten anyone on their game. Thomas, the 24-year-old from Kentucky who is a major away from joining the young elite in golf, only added to a year of low numbers. He made an eagle on his final hole at the Sony Open in January to shoot 59, and he went on to break the PGA Tour’s 72-hole scoring record. The U.S. Open didn’t seem to faze him, and he delivered a variety of big shots that led to his sensational finish. He rolled in an 18-foot birdie putt on No. 5 from the edge of the green that broke so severely that he stood with his toes facing the hole and rapped the ball toward his left foot. It took a hard turn to the right and rolled in. In the hay left of the 12th fairway, he gouged it out with a 9-iron and watched it roll to 10 feet. And with the tees moved up on the 15th hole to make it reachable, Thomas hit a 3-wood that rolled off the back slope of the green to 6 feet. He two-putted for birdie, and he rolled in a 25-foot birdie putt on the 17th. “It doesn’t matter how long, how whatever the course is,” Thomas said about the longest course in major championship history. “When you give us soft greens, good greens and not much wind, you know there are going to be some good scores. I was just happy that I was the one that was able to take advantage of it today.” But the work is not done.